There are different poodle clips a poodle can get. A housepet won't need the same clip as a show dog will. And show dogs need brushed daily or every other day. If your pet loves to be outdoors four seasons of the year, keep his coat short as it will be easier to keep clean and brush. And it will make bath time easier along with drying his hair after he's clean. Poodle clipping includes different cuts. A poodle puppy clip is for dogs under one year old and is suitable for shows. She'll have a long coat and a shaved face, feet, throat and bottom of her tail. The top of the tail has a fluffy pompon. An English saddle clip is for adult pets and is a show clip. It's fairly complex and used to hide a flaw in a show dog. Her face, feet, top of front legs, throat and tail base are shaved. The bottom of the forelegs have fur puffs and her tail has a pompon. Her hind legs have 2 hair puffs on them with a shaved area in between the two puffs at the middle of the leg, and another shaved area at the top of the leg. Her feet are totally shaved. The chest neck and head area are full, while the hindquarters have short fur with a shaved band in the middle. This cut needs maintained every 4 weeks. Poodle grooming clips include the continental clip which is also a show clip used for adult poodles. Her throat, face, feet and tail base are shaved. The hindquarters may be shaved or have a fur puff over the hip area. Each leg is shaved and has a puff at the bottom of each leg while the tail top has a pompon. This cut requires grooming every 4 weeks. A modified continental cut has the dog's hair 1" in length. There's a top shaped cap with shaved hips. The sporting clip entails the face, throat, feet and tail base to be shaved while the body is clipped so the coat is 1 inch long. The tail has a pompon. 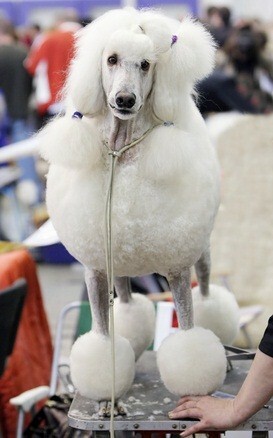 The coat will be short and curly, allows you to see your poodle's shape and is fairly easy to keep up. The retriever clip is allowed in AKC shows and is cut like the sporting clip except there is no tail pompon and the fur is cut shorter. This is a popular clip for non-show dogs as it is easy to care for. The kennel clip is the shortest, easiest and easiest maintenance clip. His feet, tail and face are shaved with a tail pompon. The hair is about 1/2" long. Another one of the poodle clips, the teddy bear clip, is cute! Scissors are the only thing used to cut and shape, no clippers. Her tail, body and legs are a few inches long. This clip requires daily brushing. Your pet will usually have a pet clip which can be done every 8 weeks. Six is better, but 8 weeks is the longest to go between clips. 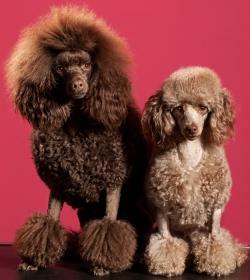 Talk with your groomer to find the style that works best for you and your poodle.